For those of you who have been patiently waiting, I am pleased to announce that my new book, The Copic Coloring Guide is now available for purchase!! (Click here to order a copy). It was so much fun working with my uber-talented and loyal friend, Colleen Schaan. 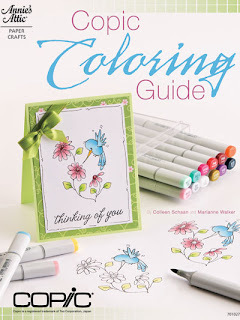 This book is great for those of you just learning Copic markers and need something to clearly step you through the coloring process. The Copic Coloring Guide is jam-packed with gorgeous papercrafting projects made by a talented team of designers...too many to name them all :), so you'll just have to go buy the book and see who contributed! I want to give a special thanks to both Colleen and our editor, Tanya, for making this book happen. It has really come together beautifully! I know that everyone who contributed to the book hopes that you will be inspired and gain confidence in your coloring ability through our efforts. It makes me all happy inside when I know that fulfilling my dreams helps others find and nurture their own talents. May you all have a wonderfully-inspired week! This weekend I am headed to teach the San Diego Certification. Where else can you visit me in the next few months? Here are some of the other places I will be going. 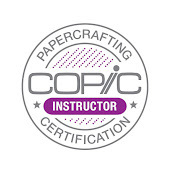 For a complete listing of upcoming Certification classes and for applications, please visit the Copic website. 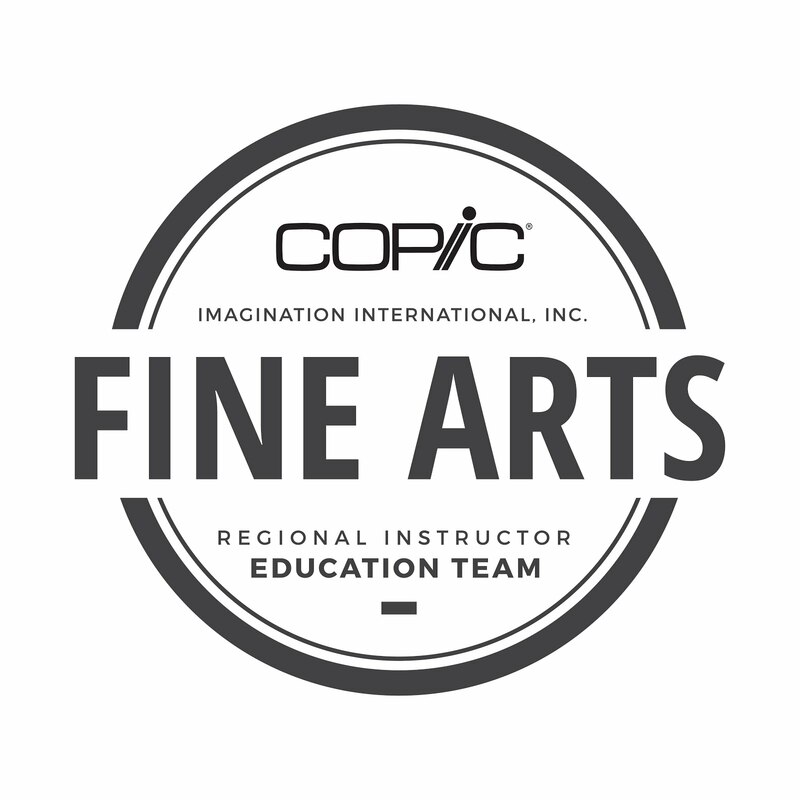 July 1-4 Los Angeles, CA Anime Expo - I will be teaching beginning marker classes for coloring Comics and I will be in the Copic booth to answer questions all weekend long. Visit the Anime Expo website for registration. I will be attending Summer CHA, though that event is not open to the public. 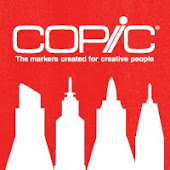 Later this summer I will also be teaching some local kids comic drawing workshops, so stay tuned for other opportunities to take a Copic workshop or class from me. I know I haven't posted a tutorial in a while, but I did make a simple card for a dear friend here at the warehouse who was having a birthday this week. While I don't have a step-by-step tutorial for this project, I will point out a bit of strategic coloring that I did while creating this card. For those of you who have taken the Intermediate Certification, you'll know what I'm getting at, when I talk about Strategic Coloring. 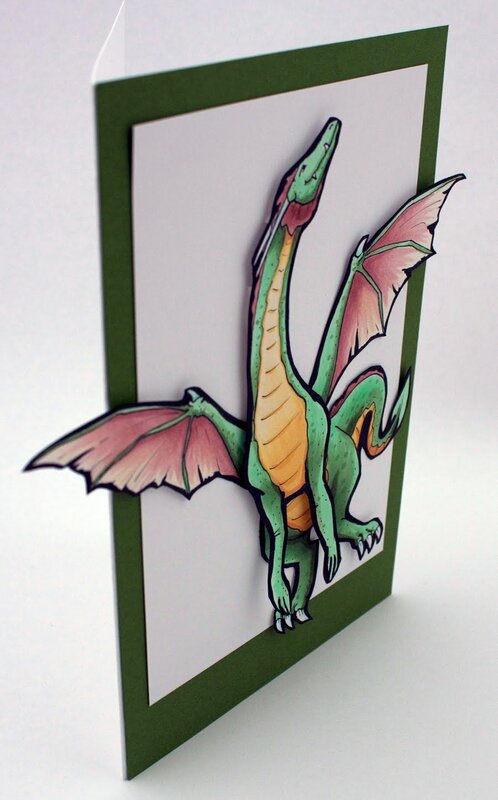 I drew this dragon as 4 pieces of cardstock, one part for the front, one for the hind end, and one each for the wings.The top layer is popped out with foam tape, then I used X-Press It Tape for adhering the rest of the dragon. You'll notice that I didn't bother to blend my colors very smoothly. However, I did add darker spots all over the green. This is to simulate irregular dragon skin. Also, it is hard to exactly determine a light source, except that there is light coming from above. This is my artistic license. The dragon is flying in midair, so there is a lot of ambient light. You can tell he's dimensional, but I'm not distracting you with too many shadows. What I want to point out is the dragon's green coloration. The main, light green I used is YG41, this is my base tone. I colored ALL green areas with a base of this color, so that all areas, no matter how I darken them, would still feel cohesive. Then, to add simple shadows, I worked in YG63. YG63 has more gray in it than YG41, so it both darkened and toned down the shadows. This makes the shadows seem to have more depth. On the hind legs and tail, I worked in G85, as G85 is even less intense than the YG's- less yellow and more blue makes the color recede more. Finally, to pull in the color of the green border paper, I added G99 to the darkest shadow areas. Because I physically popped the front of the dragon off the page, that also adds natural shadows to any portion below it. Part of the strategic coloring in this case is the yellow underbelly. See how the yellow pulls your eye right to the dragon's head? And then, the dragon is looking up, off the page. The first version I drew, the head was pointing back towards his body. However, I changed it. Compositionally, having the head pointing back to the body would create more of a circle in the line of sight. Your eye would continue flowing around and around. However, the message I wanted to convey was freedom and flight. Therefore, having the head up, the wings spread out, and the dragon at a jaunty angle with wings and legs going off the edge of the white box creates more of a sense of freedom. Also, I gave white space above the head. What this conveys to the viewer is a sense of possibilities- there is room for this dragon to continue flying, wherever his wings may take him. The wings and tail help pull the viewer back into the dragon's belly, which then draws the eye back up the yellow belly, then to the head. 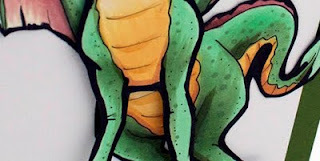 From the head, the eye travels up, hits the dark green border, then flows back around the page back to the wings and tail, which continues the flow and makes the viewer look longer at the picture. Physically having the dragon popping off the page also adds to the sense of breaking from the confines of the paper. I left his front arms unattached in any way- no extra dimensional tape or anything. This is because I want them to naturally flare out more, and to not lose the dynamic from that portion of the cast shadow. Notice how simple this card is. The image is so strong and dominant, yet clean that I didn't need to add anything else to the card front. It works as it is. 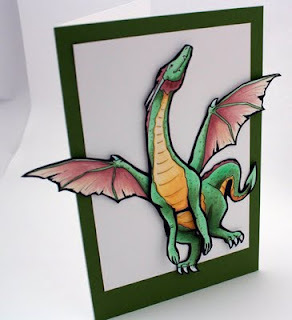 I liked this card so much that I had a hard time giving it to my friend, but since she loves dragons, I know that she loved getting this dragon card today as much as I enjoyed making it for her! May all your dreams take flight this week and I hope you get a little more insight as to how I choose colors and composition as well. Other colors I used: E04 and YR30 for the wings. YR30, Y21, and E33 for the underbelly. Boo for white claws and horns. Assorted glitter pens to add sparkle to the shadows. To give you an idea of the size of this image, this is a full sheet of paper folded in half, so it is a very large card. I have been on the road quite a bit in the last month, so I apologize for the lapse in posting. I have a few class updates to go over before I post a tutorial later this week. Each Certification class is $120 for the day, retakes are only $40. There are lots of classes open, so check for one near you. June 18th, Calgary, AB taught by Sherrie Siemens Only 2 spots left! June 19th, Crawley, West Sussex, UK (near Gatwick airport). Taught by Wendy Kadzidlo.